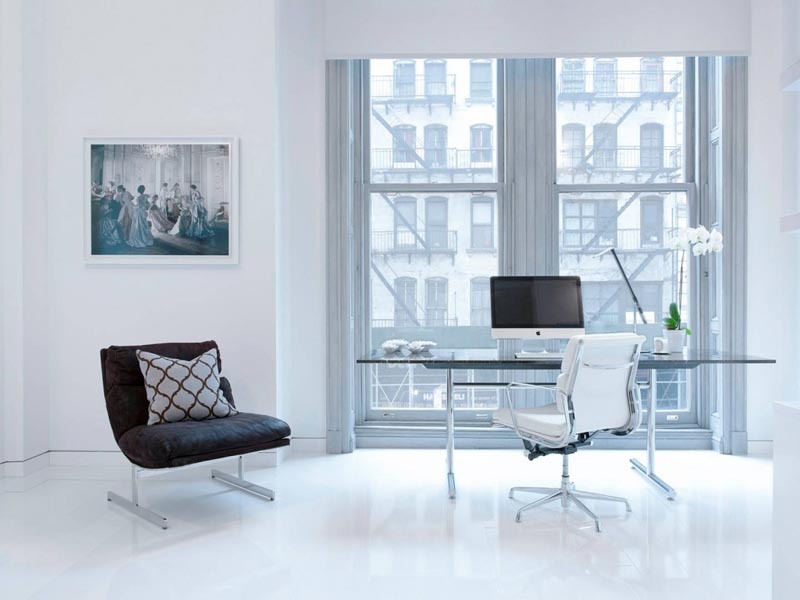 Black And White Luxury Loft Apartment in Manhattan, New York Give Cherished Feel Of Home Decoration and sense of neat and clean furniture with their properly defined space. As we all know black and white color theme is come under category of monochromatic interior design development. White color gives you the feel of openness and also provides internal peace and prosperity. In balance of white – using a black color elements and furniture in home decoration give your space a luxurious and rich feel and proper identity. 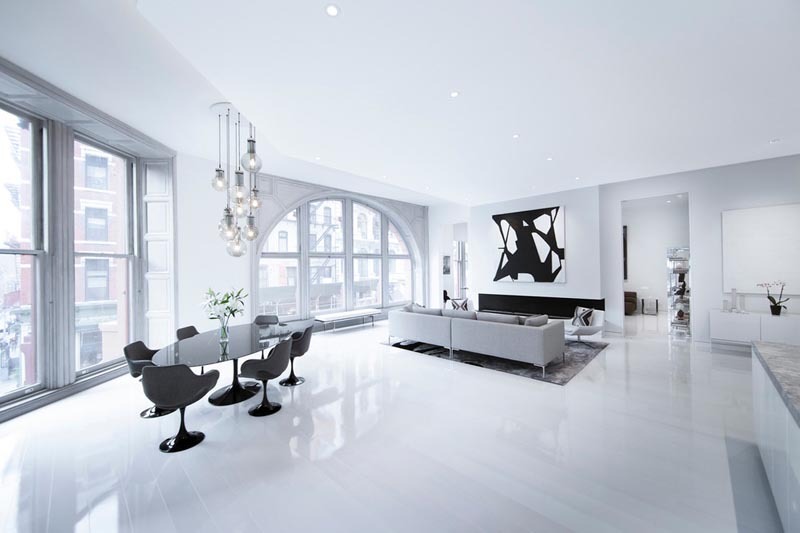 This black and white luxury interior design of Apartment Completed by David Howell Design, this luxury loft apartment is located in Manhattan, New York City. 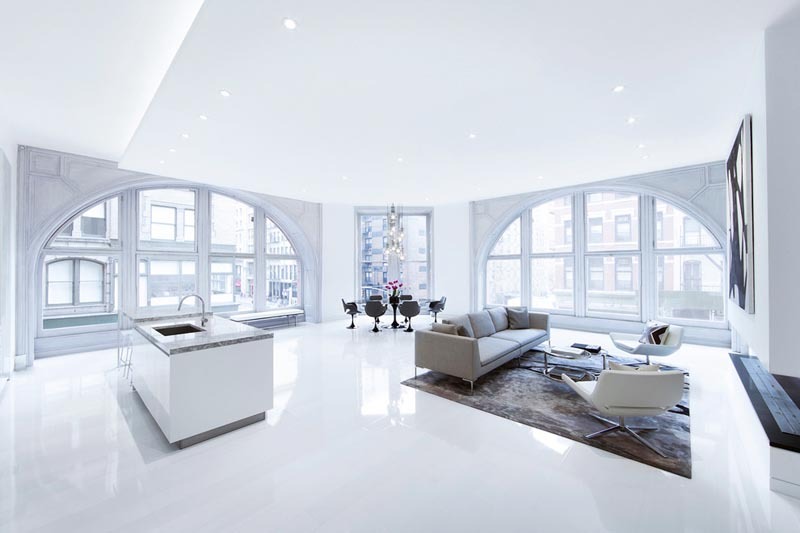 After nearly 40 years, this jaw-dropping space was meticulously renovated and painstakingly restored with specific attention to the preservation of all historic details, creating at the same time a sleek, 21st century environment of black and white luxury. All floors of luxury loft are solid wide-plank Swedish beech wood. To protect artwork and appointments, the windows have been coated with Sunshield solar film. 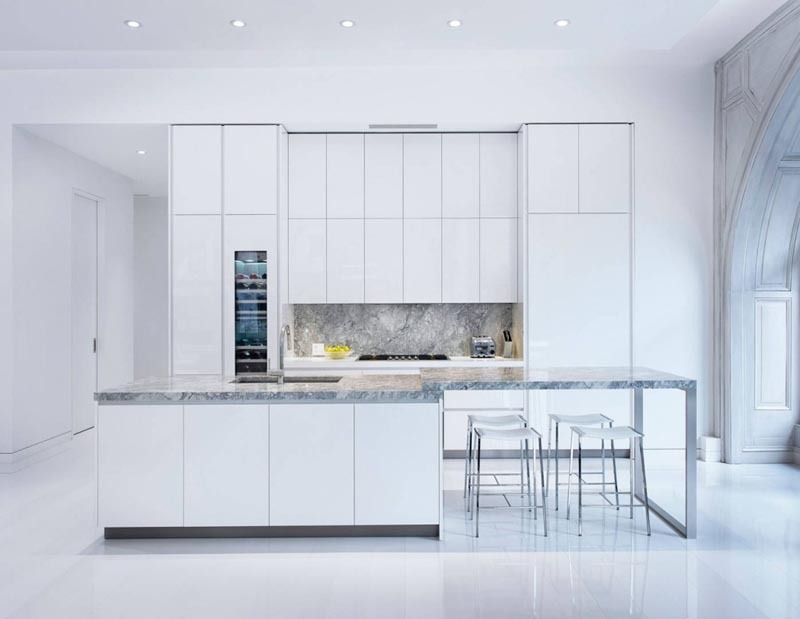 The Black and white loft has been designed with ample closets throughout, and massive custom pocket doors to increase the flexibility of the space. The huge floor to ceiling arched windows frame the dramatic and unique living space, setting the stage for the spacious 48′ great room, 10′ long stone fireplace, and 12′ marble kitchen island with separate dining area, the perfect layout for elegant entertaining. The home has 2 bedrooms and 2 bathrooms and a spacious and luminous interior. Here when we are looking at the living room with entirely washed in white texture paint and only few elements like fire place and one black and white painting hang on the fire place shouting their presence in living space. How to incorporate black and white theme in house decor? Flooring also give a light back drop of floor mat and sofa sitting in front of fire place with left side of huge French window with its historic details come up properly and give royal feel of living space with black and white color theme. Open floor plan of living, dining and kitchen space give a luxury approach of black and white luxury apartment. At the same time our eyes stop at pure black polished dining table in front of box window. 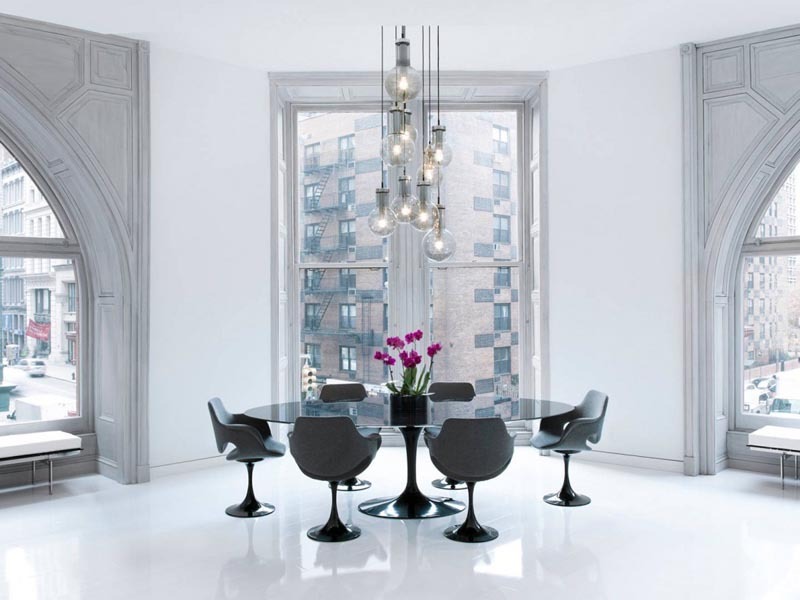 At the same time you can say placing of dining space in between the two large arched windows make them important space of this black and white picturesque environment. Full height kitchen cabinets without any additional color of tone merge their self in entirely with this space. I like the ceiling lighting fixtures systems arrangements with surrounding furniture placements. Those lighting fixtures give required luminousness of those areas. 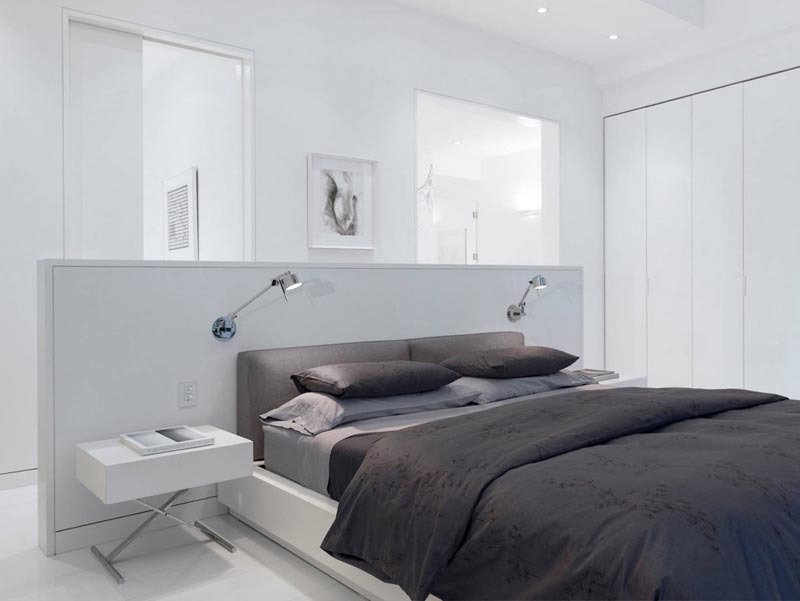 Bedroom get only bed covers and accessories in black, otherwise interior designer give full white wash of area to give a bed space serene and peace full feel. Here, in black and white luxury loft – bath space got a human skull kind of wall tiled texture pattern that give you a sense of someone’s existence with you in that space. At the same time bath and lavatories is furnished with luxury fixtures. 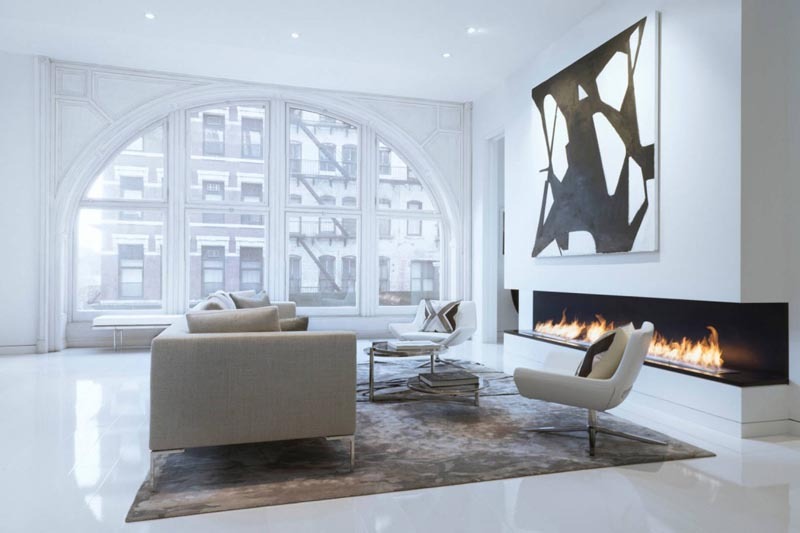 So, this is all about what designers of this beautiful black and white luxury loft think and how they are take entire space in one dimensional interior design. Have a any suggestions or thoughts on black and white interior design ideas,…!!! Share with our group or wingers.